Naval tactical warfare in the Age of Sail, 1740-1815. 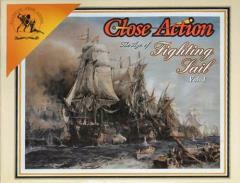 Close Action is all about teamwork and out-maneuvering one's enemy by coordinating the movements of a fleet of wooden ships. You plot movement for your ships, send signals to your friendly captains, and assign crew to various tasks such as changing sails or firing the great guns. Played on a hex grid, the ships move fairly accurately and historic battles can be recreated with lots of realism. This games scales extremely well, playing as well if not better with 20 players as with 3, 4 or 5.